A well-maintained HVAC system can ensure that your home or building remains comfortable without a huge energy cost. 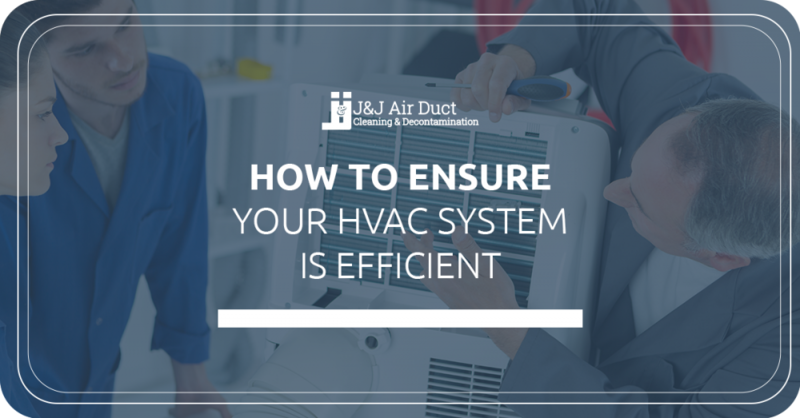 On the flip side, if you don’t have regular maintenance performed on your heating and cooling units and their ducts, you could be hindering the efficiency of your HVAC system. So, how do you ensure that your heating and cooling system is operating at its best. With clean air ducts, regular air filter changes, and scheduled maintenance, your HVAC system will operate more smoothly. Your air ducts will eventually gather dust and debris, no matter how well your air filters work. Over time, your ducts can lose their efficiency since they will slowly have restricted flow. In addition, due to the aerodynamics of your ducts, the air that should flow through your ducts can get caught on these blockages, which means that you won’t have as much air that makes it to the end of the vent. Here at J & J Air Duct Cleaning, we clean air ducts in both homes and commercial spaces. We use specialized tools to thoroughly clean out debris that has accumulated in your ducts. We provide duct cleaning services for homeowners and business owners throughout Las Vegas. Next on our list, you’ll want to replace your air filters regularly to ensure that you have fresh, clean air pumping through your system. With a clean air filter, your air will be nearly free from dust and debris and allergens. Plus, your HVAC system will run more efficiently, since air can move more freely through its input to the rest of your building. Over time, your air filters will gather dust from the environment (which is the purpose of the air filter). And eventually, this dust will pile up on the screen of your air filter. With enough dust, you’ll choke your HVAC system, making your blower fans innefficient. That’s why it’s recommended that you replace your air filters every so often. Most manufacturers recommend that you replace your air filters every three to nine months, depending on the type and quality of the filter. In addition, if your home or building is located in an area with lots of dust or pollutants, you’ll want to replace your air filter more often. In addition, if there are residents or occupants in your building that are especially prone to allergies, you should replace your filters more often than the manufacturer’s recommendation. Replacing your air filters will improve the air quality of your building, and it will ensure that your HVAC system isn’t working overtime to maintain a comfortable temperature in your building. Here at J & J Air Duct Cleaning, we also provide HVAC air filter replacement services — we’d be happy to help you out if you live here in the Las Vegas area. Beyond investing in new filters and clean ductwork, you can also have regular maintenance performed on your furnace and AC unit. Maintaining the components of these units will keep them from aging prematurely, and it’ll help them to remain efficient during their lifetimes. When you count on J & J Air Duct Cleaning, we also clean your units themselves, which maintains their longevity. Alongside our ductwork cleaning services, we’ll also open your HVAC unit to vacuum the interior of the furnace/air conditioner. From there, we’ll also clean the cooling coils of your AC unit with a HEPA vacuum and a coil cleaner. Cleaning the cooling coils will ensure more efficiency for your AC unit. Finally, we will clean the blower unit and, if needed, we will remove the blower unit to properly clean the blades, since they can accumulate lots of dust, dirt and contaminants. You’ll notice the improved efficiency in your upcoming energy bills. Whether you own and operate a business, or you’d simply like to keep the climate in your home perfect, we can help you to improve the efficiency of your HVAC system. Again, we provide air duct cleaning services and filter replacements for folks throughout Las Vegas. Get started by with a quick, free quote for your project!